A business case produced at Chicago Booth? To some this may sound like an oxymoron. For many years, there were two diametrically opposed methods of business research and education. 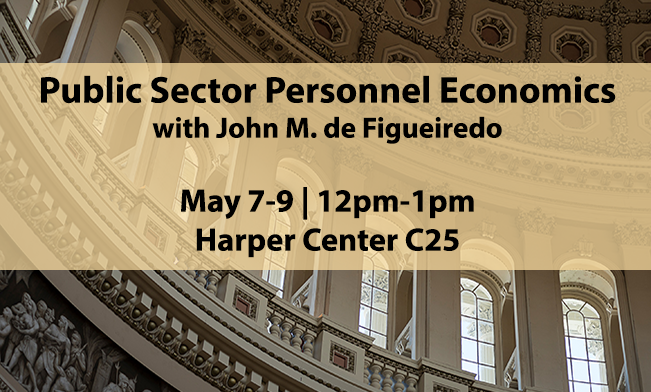 On the one side is the Harvard approach, where both teaching and research focused primarily on business cases. On the other is the Chicago approach, where research was based on statistical analysis and teaching on traditional lecturing. In the last 25 years, however, the two sides have converged. 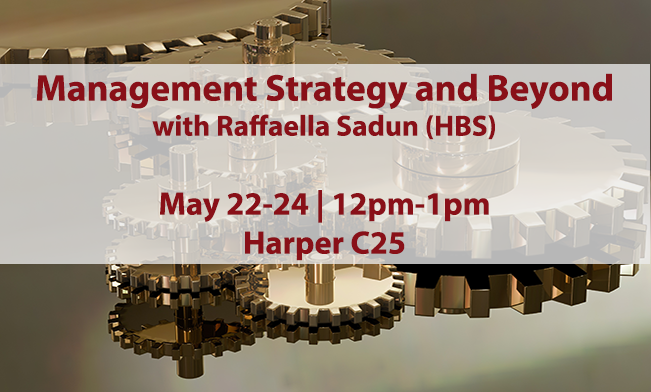 Harvard Business School (HBS) faculty does the same type of research as their Chicago peers and the Chicago faculty has incorporated business cases into their teaching. Roughly a third of the courses taught at Chicago Booth today are case-based and almost all have at least one case in their syllabus. The only part of the tradition that has survived is the Chicago faculty’s reluctance to write cases. The obvious consequence is that the world of business cases is dominated by the HBS style of case writing. First, in the choice of topics. HBS cases tend to focus on the positive dimensions of business; lobbying and influencing regulation to erect barriers to entry are rarely, if ever, discussed in business cases. But they are part of the way some businesses operate. Thus, these practices need to be discussed in class—not just in ethics classes, but in regular classes. In fact, as I have argued elsewhere, it is especially important to discuss these practices in regular classes. Second, most Harvard cases are written with the explicit consent of the company at the center of the case.1)A. Dyck and L. Zingales, “The Bubble and the Media,” in Corporate Governance and Capital Flows in a Global Economy, P. Cornelius and B. Kogut (eds. ), New York: Oxford University Press, 2003. Knowing that the company will have to give final consent, the case authors will naturally avoid controversial topics. To be fair, many Harvard case writers have told me that they complement the actual cases in their oral presentation to their students. But this occurs only at HBS: all the other users are deprived of that important component. As a result, while individual cases are not necessarily biased, the picture that emerges from all of them is, since only certain topics are covered. Third, the cases developed at Harvard are conceived for HBS classes, reducing the opportunity for interdisciplinary work. At the Stigler Center we have decided to try to change this state of affairs. For this reason, we have begun to sponsor a different type of case study, free from the yoke of companies’ consent, more multidisciplinary, and more focused on the many ways special interest groups subvert competition. 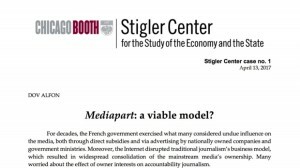 On Thursday, we will launch our first case: a study of Mediapart, a successful French media start-up. As part of the launch we will hold an event on “The Economics of Investigative Journalism: the Case of French Mediapart,” featuring Edwy Plenel, editor-in-chief of Mediapart, Marie-Hélène Smiejan-Wanneroy, co-founder of Mediapart, and James T. Hamilton, the Hearst Professor of Communication and the Director of the Journalism Program at Stanford. The case is available for download here, or through direct link to the pdf. Register for the event or watch it live. This case has already been taught at Chicago Booth in the course “Reputation, Regulation and Communications—How Media Influences Business” and in my Entrepreneurial Finance and Private Equity course with great response from the students. The teaching notes written by prof. Guy Rolnik will be available upon request to qualified teachers. The case focuses on a very important challenge: how investigative journalism can be profitable in a digital world. It is not just an interesting business question, but a very important public policy one. Investigative journalism plays a crucial role in the functioning of not only democracy, but also of capitalism itself. The story of Mediapart represents a ray of hope not just for France, but for the entire world. We will be launching two more cases soon: Cumplo, an illustration of how financial regulation creates barriers to entry for new Fintech entrants; and Disney, a case about the thriving lobbying side of one of America’s most beloved companies. The cases will be available free of charge. Please stay tuned. 1. ↑ A. Dyck and L. Zingales, “The Bubble and the Media,” in Corporate Governance and Capital Flows in a Global Economy, P. Cornelius and B. Kogut (eds. ), New York: Oxford University Press, 2003.